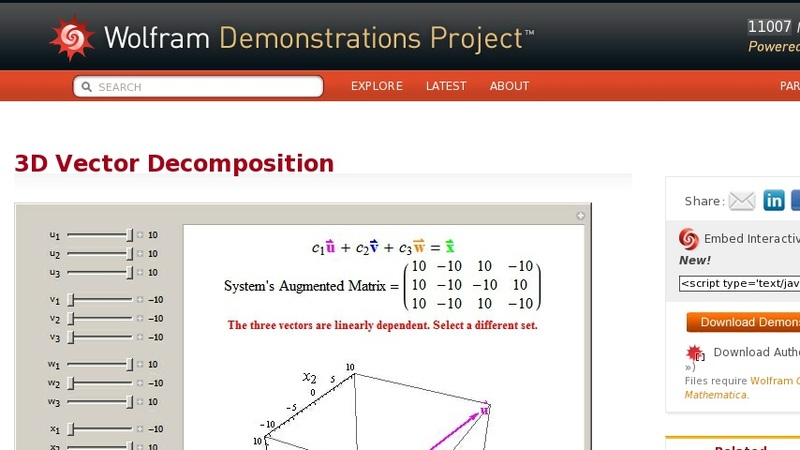 This Demonstration shows the decomposition of a vector in 3D. The components of the three vectors ... , ... , and ... defining the directions of decomposition and of the vector ... to be decomposed are adjusted using the sliders. The scalar multipliers ... , ... , ... of each of the three vectors are calculated and the prism defining the decomposition is graphed. The scalar multipliers ... , ... , ... are obtained by solving a linear system having an augmented matrix with columns defined by the components of ... , ... , ... , and ... . If the determinant of the system is zero, corresponding to ... , ... , and ... being linearly dependent, a message is displayed prompting the user to make another selection.